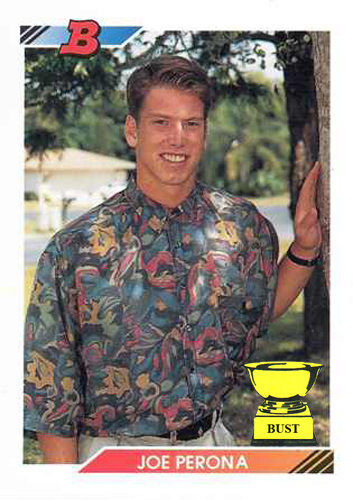 Spring training + spring fashion = the return of a classic: A few months back, the Bust set the fashion world on its head with Bowman Fashion Week, seven days' worth of cards from the 1992 Bowman set featuring a bunch of rookies and minor-leaguers wearing atrocious clothing. It was so popular, traffic to our site more than doubled, garnering up to 20 visitors per day. Hey, we're not ones to mess with success, so cover your eyeballs it's time for more early '90s style. Today's fashion model: Here we see Detroit Tigers draft choice Joe Perona taking a break in the shade. Too bad, Joe your clothes are still hot! Joe's wearing an oversize button-down that incorporates every color known to man. And yes, those buttons do go all the way up. What's that you say? The pattern looks like somebody threw this shirt into the dryer with a bag of Skittles? Well, it's time to taste the rainbow! The bagginess of Joe's shirt is a tactical choice, covering his underdeveloped biceps and girlish waist, thus making him look more like an actual athlete. Downstairs, Joe's wearing a pair of his dad's Dockers and his only belt, a classic black number that he's had since he was 14. And while Joe will never make it past AA in baseball, that black leather wristwatch is ready for The Show. Cheers to you Joe looking like this, you'll never be Perona non grata!